GENU-TEX® combines the benefits of both rigid braces and bandages. Proprioceptive stimuli activate muscular activity. The knee joint is stabilised and controlled. 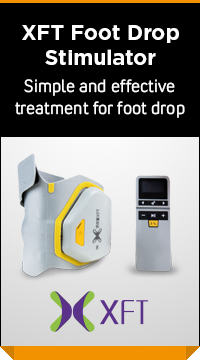 GENU-TEX® can be individually adjusted by an orthopaedic technician for controlled limitation of knee movement. This dynamic orthotic is easy to put on and very comfortable to wear. It is especially suitable for geriatric or athletic use. The highquality polycentric joints are completely covered in soft fabric. Local pressure symptoms and impaired circulation can be prevented with sufficient certainty on an individual basis if allowance is made for any contraindications and with nonrestricting consistently shaped body fitting. - To fit the GENU-TEX®, it is better for you to sit on a chair so that your knee is slightly flexed. - After opening all the Velcro fasteners, grasp the GENUTEX® with both hands holding the integrated pull straps with the popliteal stitching showing. Then pull the GENU-TEX® over your ankle until it is below the popliteal cavity (Fig. 1). - Then turn the GENU-TEX® 180° at the lower leg. The popliteal stitching shows at the calf (Fig. 2). - Next, pull the GENU-TEX® over your knee until the silico nering encloses the kneecap (Fig. 3). - Now close the Velcro fasteners (upwards) as numbered in Fig. 4 with slight tension. - Stand up and check again whether the silicone ring still encloses the kneecap well (Fig. 5). If necessary, re-adjust the GENU-TEX® to your leg and then pull all the Velcro fasteners in such a way that all 8 fastening straps fit the leg well with even traction (Fig. 5). - To remove the GENU-TEX®, generally all you have to do is just open the front Velcro fasteners and proceed as described in 2-3 above in the reverse order. Circumference f = 14 cm from the middle of the knee upwards. NOTE: the GENU-TEX® knee brace is supplied with 5° extension stop. using the enclosed extra white or green plastic ring; alternatively, settings can be made only using the setting screw. See the „Controlled movement limitation“ graphic for setting information. Gradient settings should only be made after consultation with your GP. own anatomical circumstances using circular saw sets. as part of our Quality Management System. heel pad can be cleaned with a moist cloth. washing. The Velcro fasteners will then last longer.